Paddling beyond the fringe of civilization–that's the essence of this book. From the oil slicks of Prince William Sound to the sunny coast of Mexico, Rogers takes his readers on a series of sea kayaking adventures down the Pacific Coast. But this is more than just an outdoor adventure book about one of the hottest new sports. It's a story of a man's quest for beauty in nature and himself.To Joel Rogers, sea kayaking is a life sport, as well as a life-support system. 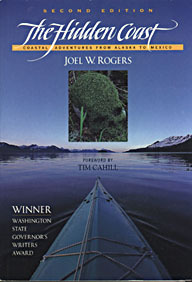 Rogers takes his readers on a series of kayaking adventures starting at Prince William Sound and ending in the mangrove's Mexico's Pacific Coast. Each adventure involves from one to a dozen kayakers, many of them novices, as they paddle their way through the fjords of Alaska's panhandle and down the Pacific coast. One of the most unique is a close encounter Rogers and his fellow kayakers have with a pod of orca whales. In his account of kayaking the Skagit River Estuary along the coast in Washington State, Rogers likens it to "nature's nursery school for fledgling kayakers–safe shallow and sandy-bottomed..." Here is a rich environment, the most productive of any in nature. Rogers makes his readers' senses come alive on the river. He makes readers listen to the sounds of the water, as he stops paddling and drifts amid the overhanging alder and groves of towering cottonwoods. He points out the faded blond of winter grasses. To him, "last year's spirea looks like pink lemonade in bloom." The environment comes alive through Rogers' words. A "V" of snow geese heading inland above sandpiper-like Dunlin about the size of a "fluffed-up robin on stilts." He ends his book in sunny Mexico amid the mangroves of La Manzanilla, where the dry rasping of palm fronds of the palapas lulls kayakers to sleep to rest for another adventure. This book is full of compelling writing accompanied by equally compelling photographs. Rogers offers an informative Access Guide, giving information about all the places discussed in the book. This book is a must read, even for the arm-chair adventurer.